When Maria Montessori went on her first journey to the USA in 1913, she was greeted enthusiastically. The press honoured her as “the most interesting woman in Europe, […] who revolutionised the educational system of the world […] and whose success was so great that the Montessori Method spread from nation to nation, in the east up to China and Korea, in the west up to Honolulu and in the south up to the Republic of Argentine” (quoted according to Rita Kramer). Thousands of people tried to gain access to Montessori’s lectures. Prominent personalities including the then President and his wife sought her company and openly supported her work. In only a few years, Maria Montessori had become a world-famous personality, although she had published her first book only in 1909; in it, she described the essential features of her educational work in the “Children’s House” in Rome that she had founded for two- to six-year-old children in 1907. Who was this woman whose educational theory attracted world-wide attention in such a short time? Which new insights as to the education of young people did she gain? Maria Montessori was born in Chiaravalle in the Italian province of Ancona on August 31st, 1870. She grew up in a bourgeois family, since 1875 due to a professional transfer of her father in Rome. There, schools and the educational system were better than in the province. After she had attended primary school, Montessori went to a secondary school that put the main emphasis on science and technology, a school that girls attended only in exceptional cases. This unconventional journey through life continued with her study of medicine, which, at that time, was not open for women in Italy. Maria Montessori overcame all difficulties and, in 1896, became the first female doctor of Italy. In the same year, the young academic, who was also socially committed, represented the Italian women’s movement at the International Women’s Congress in Berlin with great success. The speeches on women’s emancipation she gave there are of interest even today (cf. e.g. Ch. Schiersmann, “Frauenleben im Lichte Montessoris”, in: B. Fuchs/ W. Harth-Peter (eds. ), „Montessori-Pädagogik und die Erziehungsprobleme der Gegenwart“, Würzburg: Königshausen & Neumann, 1989, pp. 116-127). The doctor found her way to education through disabled children, with whom she worked at the Psychiatric University Clinic of Rome. She realised that the problems of these mentally retarded children, who were kept in “lunatic asylums” at that time, were not only purely medical in nature but also, and often even primarily, educational. Referring to the two nineteenth-century French doctors Jean-Marc Itard (1775-1838) and Édouard Séguin (1812-1880), who had fallen into oblivion but whose works Montessori had studied intensively, she conceived an educational support programme for these children and promoted it in lectures. Her main idea was to stimulate the children’s senses in order to activate and develop their intellectual potential. For two years, Montessori was head of a training institute for special-needs teachers in Rome and of a school for disabled children attached to this institute, where she herself taught intensively. In retrospect, she writes: “These two years of practical experience are the basis of my claim as to education” (M. Montessori, “Die Entdeckung des Kindes”, Freiburg: Herder, 1980, p. 27). To people’s great astonishment, Montessori succeeded in supporting some of her mentally retarded children to such an extent that they were able to achieve similar results in state examinations to non-disabled children in mainstream schools. Montessori now thought about whether the insight she gained in her work with disabled children could be of any use in the education of “normally” developed children. At the end of 1901, she gave up her work at the institute and the school and – although a famous and acknowledged personality - took a second degree at the University of Rome, studying principally anthropology. As part of her studies, she spent a great deal of time observing in schools and carried out different empirical studies there. Partly responsible for her decision may have been the fact that the relationship to her colleague Doctor Montesano, the father of her son Mario, who was born illegitimately in 1898, had finally broken up. In 1904, Montessori was appointed lecturer in Educational Anthropology at the University of Rome. Again, the highly educated university teacher owed essential impulses for the further development of her educational theory to practical experiences with children: She accepted the offer to run a centre for two- to six-year-old children from working families in the poor district San Lorenzo in Rome and to conceive an educational support programme for them. In 1907, she opened her first “Casa dei Bambini” (“Children’s House”). In her work with these non-disabled but socially disadvantaged children the Italian doctor and educationalist gained further insight. Of vital importance is her observation (contrary to prevalent theoretical opinions at that time) that even small children of about three years are capable of working at a task with the highest level of concentration if they are allowed to choose an occupation that corresponds to their respective developmental needs. Montessori calls this phenomenon the “polarisation of attention”. She observed that the children’s highly concentrated activities had extensive educational effects that affected their whole personalities. In this context, she speaks of the “normalisation” of the child, i.e. the restoration of the positive possibilities which the child has by nature but which are distorted if the child is treated inadequately by adults (“deviations”). “And from now on,” summarises Montessori, “I endeavoured to look for didactic material that makes concentration possible; furthermore, I studied conscientiously which environment offers the most favourable external conditions for this concentration. In this way my method began to develop” (according to: Maria Montessori, “Dem Leben helfen” (Kleine Schriften 3), Freiburg: Herder, 1992, pp. 44f). News of the unusual educational success that Montessori achieved with the children of San Lorenzo spread rapidly. Visitors from many countries travelled to Rome in order to get their own idea of Montessori’s educational concept. Further Children’s Houses were opened. Montessori decided to abandon her academic career at the University of Rome and to give up her paediatric practice. From now on, she devoted herself to refining her educational ideas and making them known throughout the world through lectures, publications, congresses, international training courses for educationalists and the foundation of educational institutions. In 1909, her first book was published (“The Montessori Method”). Even before the First World War her conception spread in many countries of the world. Montessori now began to lead a cosmopolitan life that brought her into a lot of countries and that lasted until her death. She then developed her educational concept, extended it to primary schools, i.e. to children who are between six and twelve years old, and tested it. In this context, she published a comprehensive work which formed part two of her work of 1909 (cf. Maria Montessori, “L’autoeducazione nelle Scuole Elementari”, Roma 1916). In 1916, Montessori moved to Barcelona. There, she carried out experiments in religious education, which she reported repeatedly later on (cf. Maria Montessori, “Kinder, die in der Kirche leben”, Freiburg: Herder, 1964; Maria Montessori, “Gott und das Kind” (Kleine Schriften 4), Freiburg: Herder, 1995). However, she never confined her educational concept to a single philosophy of life, for she wanted all the children in the world to benefit from her educational ideas. This is possible because her ideas are based on insight into the human being and his development that, according to Montessori’s world-wide experiences, in its fundamental principles is independent of any cultural, social, ethnical or religious peculiarities and instead is founded on a general humane basis. After the First World War Montessori worked for the “New Education Fellowship” and intensified the exchange of ideas with prominent New Educationalists of that time. This is shown in concepts for a secondary school that she now presented as well as in new ideas for the structuring of primary school (cf. Maria Montessori, “Von der Kindheit zur Jugend”, Freiburg: Herder, 1966). In 1929, the “International Montessori Association” (AMI) was founded. Prominent personalities of that time were members of it and sponsored it. Montessori further developed her educational concept. Particularly in the 1930s Montessori was committed to an education that aimed at peace (cf. Maria Montessori, “Frieden und Erziehung”, Freiburg: Herder, 1973; Maria Montessori, “Die Macht der Schwachen” (Kleine Schriften 2), Freiburg: Herder, 1989) and, in the context of educational theory, developed the concept and different forms of realisation of a “cosmic education” (cf. Maria Montessori, “Kosmische Erziehung” (Kleine Schriften 1), Freiburg: Herder, 1988). In 1936, she had to flee from Barcelona on account of the Spanish Civil War and moved to the Netherlands. Due to the war she lived in India from 1939-1949. There, important parts of her late work developed (cf. e.g. Maria Montessori, “Das kreative Kind – Der absorbierende Geist”, Freiburg: Herder, 1972). As early as 1946, she organised and carried out an international training course in London again. After she had returned to the Netherlands in 1949, Montessori, who was almost eighty years old, remained tirelessly active and still travelled around the world in order to give lectures. On May 6th, 1952, she died in Nordwijk aan Zee, just as she was planning a trip to Ghana with her son Mario, who had become her closest associate, in order to help set up a state education system (cf. Rita Kramer, p. 435). At the end of her life Montessori frequently reflected upon what was the most important achievement in her life. In this context, she emphasised that, basically, it was not correct to call this achievement a new educational method. The term “method”, which she herself had often used for her conception in earlier times, was, strictly speaking, too narrow. Instead, it was her concern to foster the human personality comprehensively. 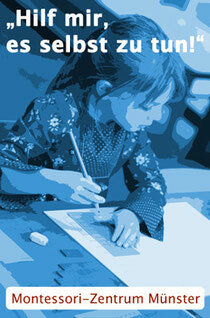 Montessori wrote: “We must consider the human personality and not a method of education. For the word ‘method’ we should substitute something like this: ‘help given in order that the human personality may achieve its independence’ or a ‘means offered to deliver the human personality from the oppression of age-old prejudice regarding education.’ The defence of the child, the scientific recognition of his nature, the social proclamation of his rights, must replace the piecemeal ways of conceiving education. The ‘human personality’ belongs to all human beings. Europeans, Indians and Chinese etc. are all men. If therefore certain vital conditions are found to be a help to the human personality, these concern and affect the inhabitants of all nations” (Maria Montessori, “The Formation of Man”, Adyar 1955, pp. 6f).